On the ground floor there is a open plan living area with comfortable sofas, dining table and a fully equipped kitchen. Further on this floor a double bedroom with bathroom, a bedroom with bunk beds, a single room and another bathroom. On the first floor there is a double bedroom with bathroom and a balcony. On the lower floor there is a spacious living area with TV, a games room with table tennis table and pool table and 2 bedrooms. One of the bedrooms has a double bed and a sofa bed for 2 children. The other bed room has a single bed. There are 2 bathrooms. In the well-tended garden lies a private pool (12 x 5) that can be heated against a supplement. Spectacular views from the pool terrace of coast line and ocean. 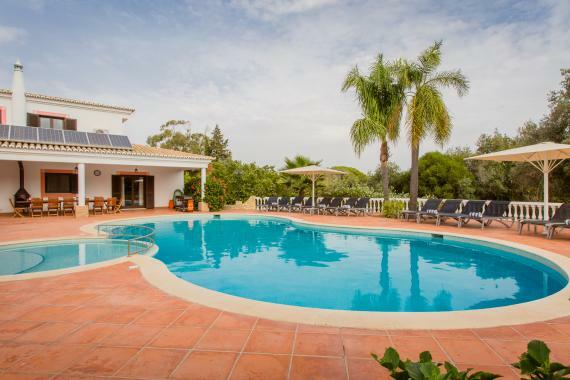 There are 6 sun beds, comfortable outdoor furniture, a BBQ and 2 bicycles. Vacation villa Marinha is located on the Atlantic coast near Cascais (Portugal). Beach: 5 min. drive. Cascais: 11 km. Estoril: 13 km. Lisbon: 50 km. Cabo da Roca: 6 km. Sintra: 22 km. Restaurants: 4 km. Supermarket: 4 km. Golf Quinta da Marinha: 15 min. drive.